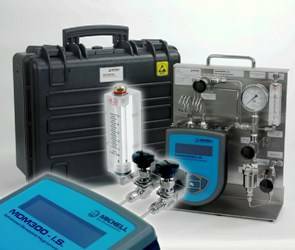 Michell Instruments’ compact and convenient sample options ensure the best results from their portable hygrometers, MDM300 and MDM300 I.S. Without sample conditioning the results of moisture measurements may be affected by pressure, while sensors are at risk of damage by particles, liquids or glycol in the sample gas. Michell has specialised in industrial hygrometry for four decades and this expertise has produced compact and light sample systems which ensure that making spot-checks of moisture with a portable hygrometer will give readings that are as reliable as online measurements. Various sampling options are available giving users the choice of the best system for their needs. According the MDM300 product manager, Auberon Tatum, the most popular and flexible of these is the MDM300 sample panel. ‘It is a fully-functioning sample system that is also light and easily portable,’ he explains. ‘It provides both flow control and filtration, but is also compact and light enough to carry.’ The sample panel is capable of measuring moisture in gases under pressure – up to 300 barg – and will operate in temperatures up to +50°C. It takes just a few minutes to set up the system: the MDM300 is mounted on to the panel and connected to the inlet and the outlet. This only needs to be carried out once, as the complete system can be transported between sample points, ensuring that using the sample panel makes no impact on the speed at which measurements can be made. For further protection, a robust case is available to transport the system over longer distances, even within hazardous areas. Further sampling options and accessories for the MDM300 range are available including kits with sample pump, SF6 application kits and a medical gas kit for clean air in hospitals. Michell’s Easi-fit and Compressed Air Kits are suitable for applications where the sample is above atmospheric pressure. The Compressed Air Kit includes a particulate filter and fittings to make it easy to connect into a compressed air system. The kits are small, making them a convenient method to ensure correct measurements from common applications for the MDM300.